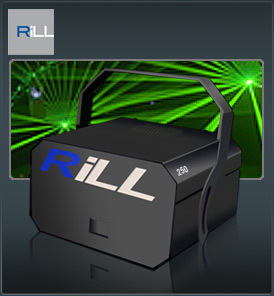 The RiLL Emerald 250 is our smallest system but is armed with a razor sharp tight laser beam so this laser is exceptional bright for it output power The RiLL Emerald 250 is designed with the smaller clubs and discos in mind and is the little brother to the RiLL 500, the similarities with the RiLL 500 don’t stop there Like its bigger brother the RiLL Emerald 250 packs in many features the Rill 500 is famous for. The RiLL Emerald 250 maybe our entry level system but like all rill lasers is a professional system so quality comes as standard. Put the RiLL Emerald 250 together with the PM 2000 laser controller the possibilities become endless, with its stunning graphics, animation and text. You’re sure to be impressed. The RiLL Emerald 250 Tight Bright and with a killer punch!